banana buns recipe - mildly sweet fried bread made with mashed banana, flour and sugar. these sweet banana pooris are a specialty of mangalore in karnataka. mangalore buns recipe with step by step photos – sweet banana pooris or mangalore banana buns as they are known is a recipe from mangalore in karnataka. i remember having these sweet banana buns when my aunt used to get them from mangalore along with the other manglorean goodies. at that time I did not know how they were made. my aunt originally belonged from manglore and whenever she used to make a visit to mangalore, she would get manglorean sweets and delicacies back to mumbai. the mangalore buns recipe is easy and simple to make. the dough has to be kept for about 3 to 4 hours at room temperature. i generally prepare the dough in the night and then keep in the fridge. usually these buns are made with maida or all purpose flour. i make these mangalore buns both with whole wheat flour (atta) or all purpose flour (maida) or half-half of both. 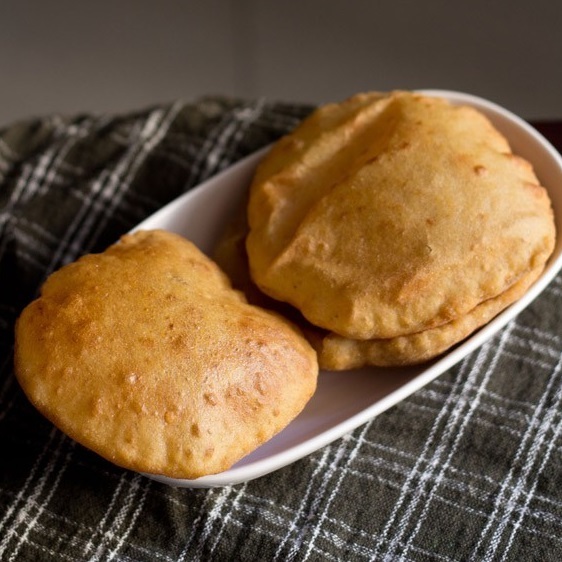 the buns made with whole wheat flour taste good and have a texture similar to a poori. the buns made with all purpose flour also taste good and have a soft fluffy texture from within. the recipe also works well with over ripe bananas. the amount of sugar can be adjusted as per taste and the sweetness of the bananas. 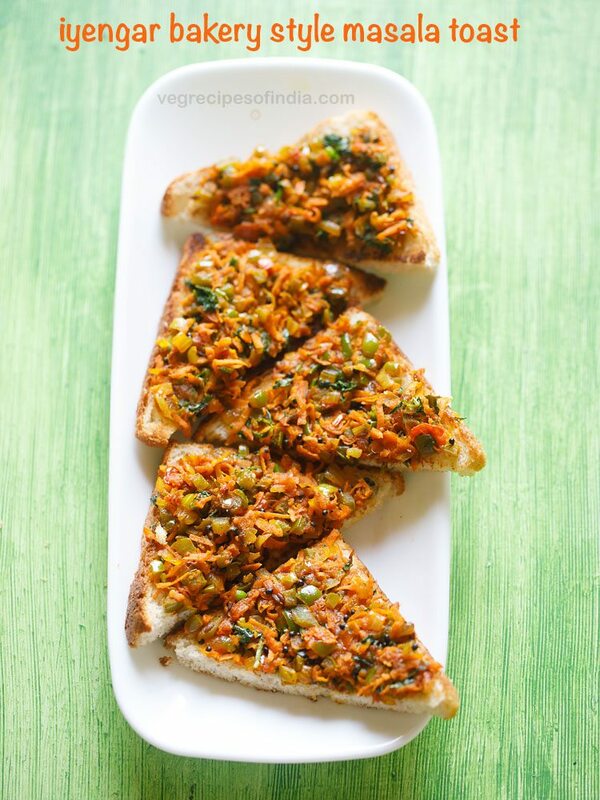 these sweet mangalore buns can be had as a breakfast or even as a snack. they make a delicious breakfast. generally we have them plain with the morning tea. but you can have them with some milk or even coconut chutney if you like. 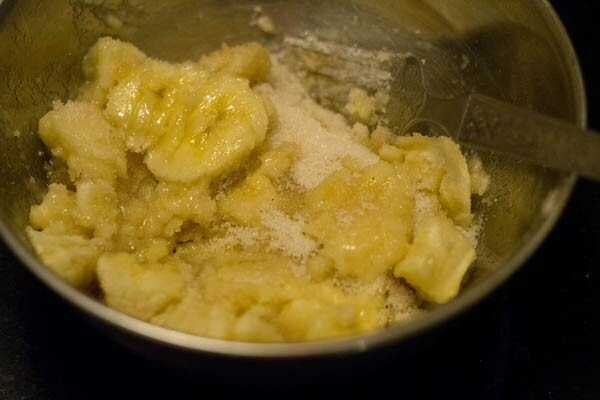 in a mixing bowl, take the chopped banana and sugar. the sugar helps in the mashing of the bananas very well. you can also just puree the bananas in a blender and then add sugar. the bananas have to be mashed well. 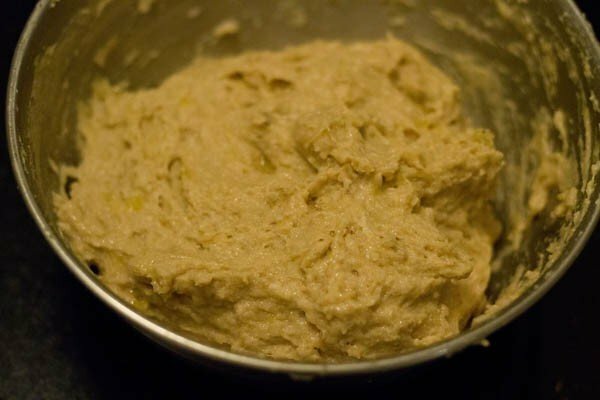 add the flour (whole wheat flour or all purpose flour or mix of both), 1tbsp yogurt, salt, ghee, baking soda and cumin powder to the banana puree. if you can knead with 1 tbsp yogurt, then fine. if the mixture looks dry, then add 1 tbsp yogurt again and knead. the quantity of yogurt required depends on the type and quality of flour. i used 2 tbsp yogurt to knead the dough. knead into a smooth dough. the dough is slightly sticky. so while kneading you can apply some oil/ghee in your hands and knead. if the dough becomes very sticky, then add some whole wheat flour and sugar accordingly. keep the dough covered in a bowl for 3 to 4 hours at room temperature or refrigerate the dough overnight or for 7 to 8 hours. lightly knead the dough the next morning or after you have kept it for 3 to 4 hours. take small to medium sized balls from the dough and roll into round pooris. 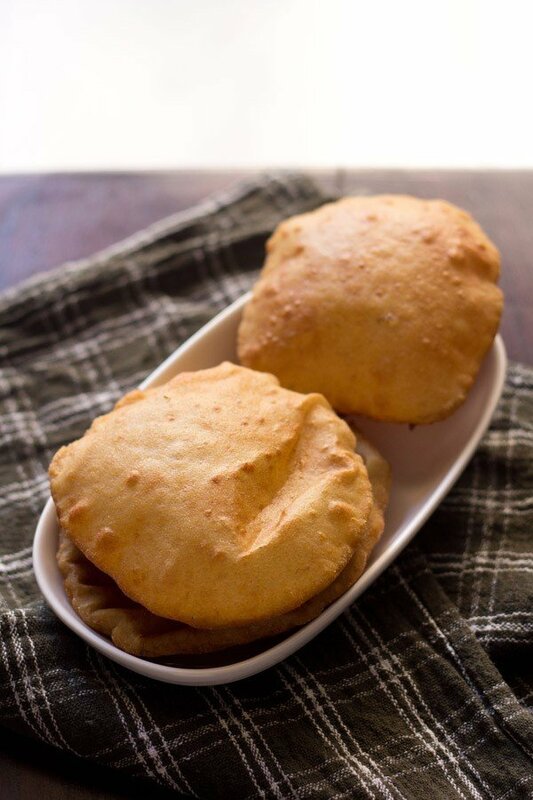 slid each poori into medium hot oil and fry the banana pooris till they are puffed and golden. take care that the banana buns does not break in oil otherwise they soak lot of oil. remove the banana buns with a slotted spoon and drain on paper napkins to remove excess oil. serve the mangalore buns, hot or warm plain or with milk or a cup of tea of coffee. 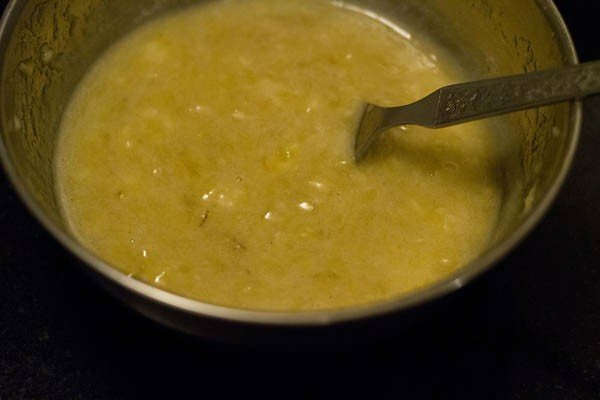 1. in a mixing bowl, take the chopped banana and sugar. the sugar helps in the mashing of the bananas very well. you can also just puree the bananas in a blender and then add sugar. the bananas have to be mashed well. 2. the banana puree is ready. 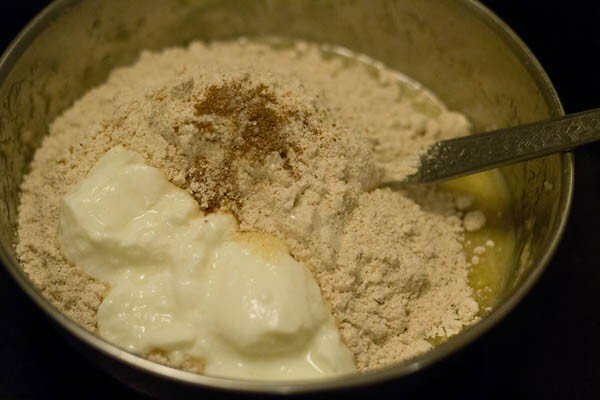 3. add whole wheat flour/atta, yogurt, salt, baking soda, ghee/oil and cumin powder. first add 1 tbsp yogurt and knead. if the dough looks dry then only add more 1 tbsp yogurt more and continue to knead. 4. mix and then knead into a dough. the dough will be slightly sticky. so while kneading you can apply some ghee/oil in your hands and knead. if the dough becomes very sticky, then add some whole wheat flour and sugar accordingly. the quantity of yogurt required depends on the type and quality of flour. i used 2 tbsp yogurt to knead the dough. 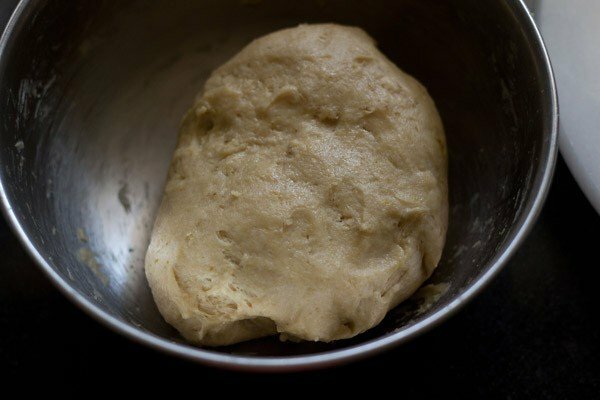 5. keep the dough covered in a bowl for 3 to 4 hours at room temperature or refrigerate the dough overnight or for 7 to 8 hours. 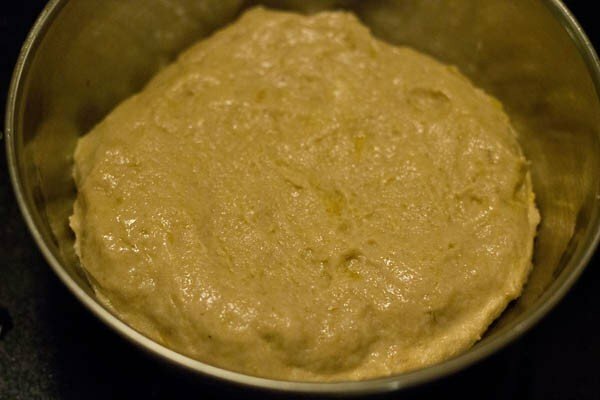 6. lightly knead the dough the next morning or after you have kept it for 3 to 4 hours. 7. take small to medium sized balls from the dough. dust the rolling board with flour and roll into round pooris with medium thickness. don’t make the pooris thin. 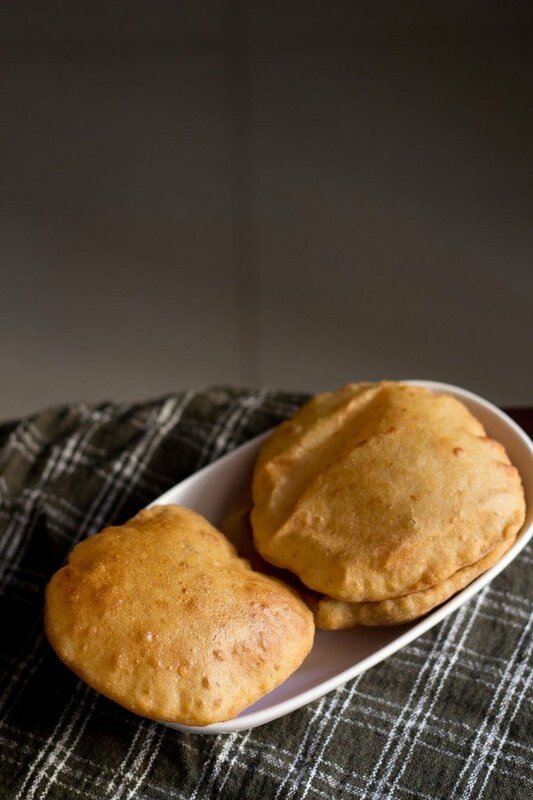 8. shake off the excess flour from the rolled poori and slid each poori into medium hot oil and fry the banana pooris till they are puffed and golden. take care that the banana poori does not break, otherwise it absorbs oil. 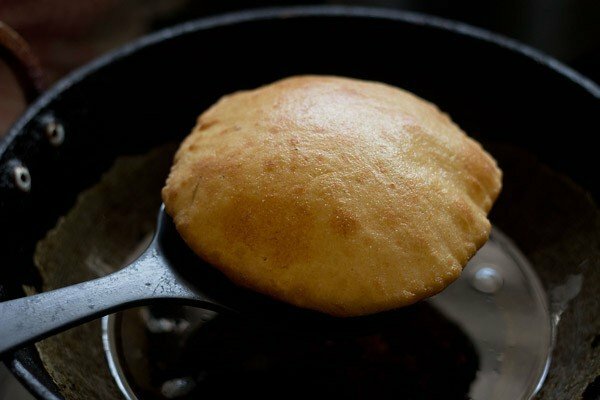 9. remove the mangalore buns or pooris with a slotted spoon and drain on paper napkins to remove excess oil. 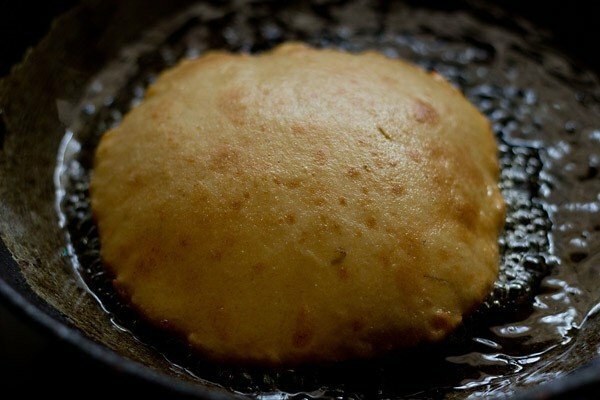 10. serve the mangalore buns, hot or warm plain or with milk or a cup of ginger tea or filter coffee. First disolve th sugar in the curds and then add maida. Knead it lightly into a dough. Let it rest for min 4-5 hours. U hv to roll into just 1.5 or 2 inch dia and thickness of 1cm. Can make a hole with finger in the centre. Fry these in oil. They bloom like buns. 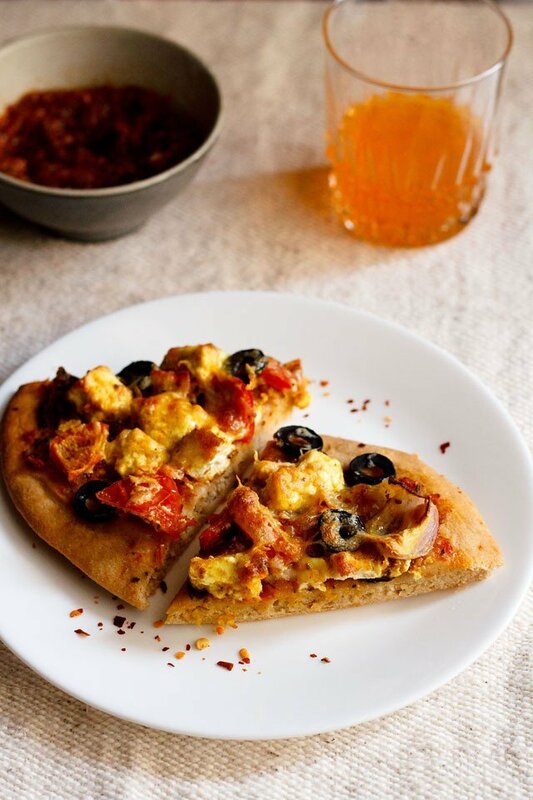 thanks a lot swati for sharing your SIL’s recipe. i will give a try. thanks again and have noted down the recipe. Thanks Amit. Wishing Happy Ganesh Chaturthi to you also. Can you use baking powder instead of b. Soda? Zainab, yes you can use. Thank you for the recipe. It turned out great. can we skip baking soda? 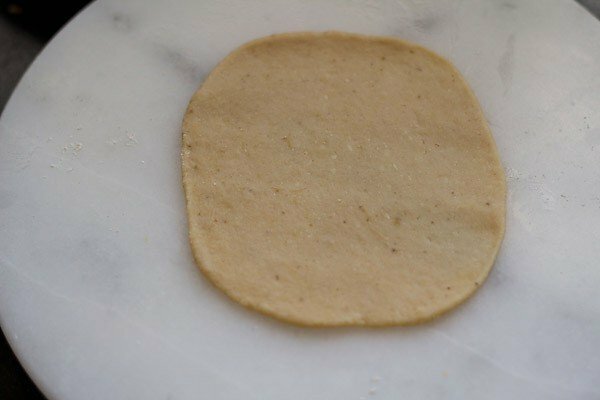 If yes, how to still make reasonably soft pooris? Welcome Nikita. you can skip. 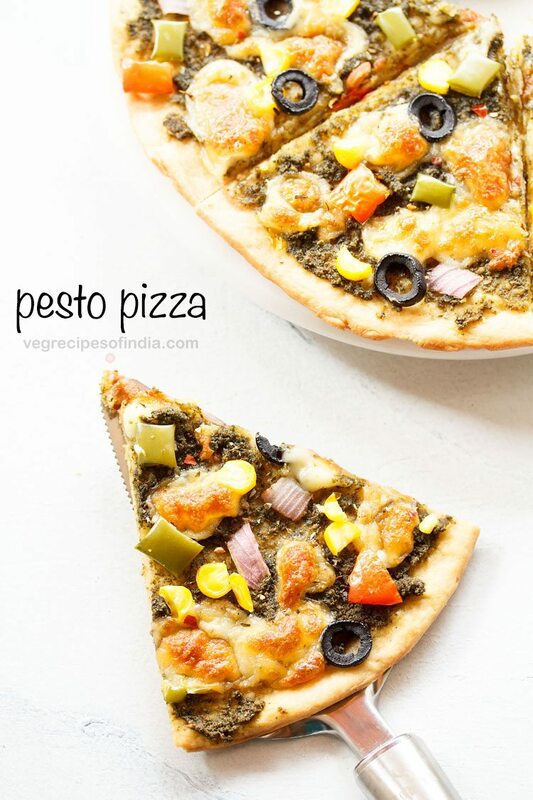 just knead the dough very well to get the soft pooris. These are my favorite. Thanks for the recipe Dassana. Can you please post the recipe for Cashew macaroons that we get in Mangalore? I Dassana , I prepared the buns at home . It came out very well. Everyone liked it very much. And my parents were asking again and again to prepare the same .. 🙂 The instructions which were given by you are so clear . Loved the recipe. Thank you. 🙂 One more question It will come out well if the buns are prepared using both wheat and maida half half?? thanks a lot jyothi. yes they do come out well if prepared with both maida and atta. i have tried it a couple of times. but with maida, you may need to add less curd while kneading. otherwise dough can become sticky. thank you david. yes overipe bananas will taste good. i think the hot pizza stone method should work. i hope the buns turn out good for you. a suggestion would be to add a bit of instant yeast for the leavening process if baking. sure do let me know. I wanted to know the recipe for mangalore buns from many years. thanks for posting it. 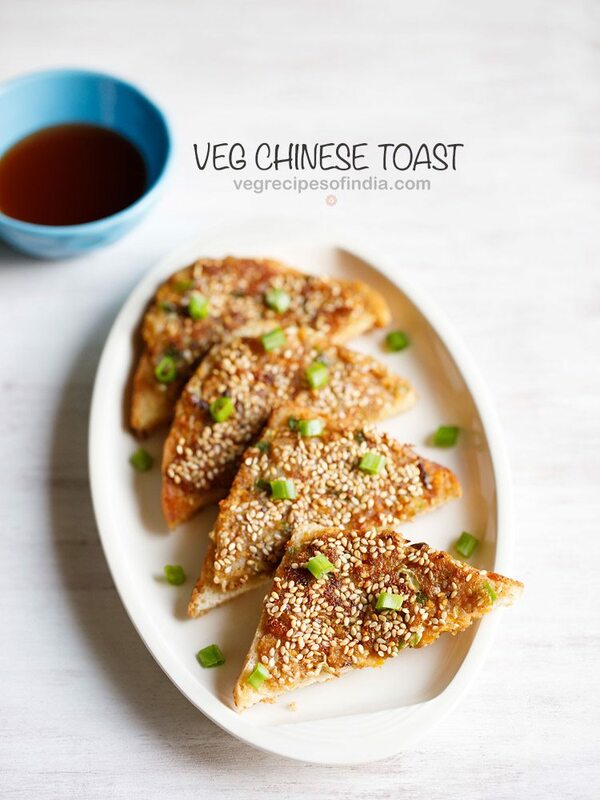 I made this for evening snack and everyone loved it… thanks a ton..